Size: 5.4" x 3.1" x 0.50"
This TI-1706SV introduced together with the TI-503SV and TI-1795SV a new calculator design style in 2003. Compared with the first generation of the TI-1706SV the successor has a stylish coloring schema using a mixture of white, silver and blue elements. The protective cover for backpack and briefcase completes the design style of the TI-1706SV. Please notice the small window in the cover for the nameplate of the calculator. Dismantling the latest TI-1706SV manufactured in February 2003 by Kinpo Electronics in China is somewhat boring, the internal construction is similar to its predecessor. Main difference is the usage of much thicker plastic for the housing parts, the overall weight (without protective cover) raised from 1.9 ounces to 2.3 ounces. 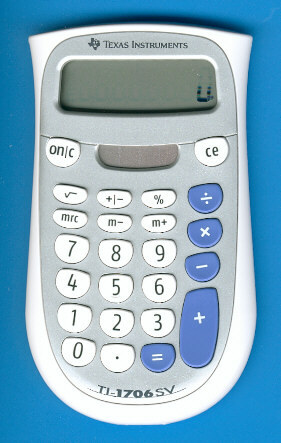 Texas Instruments continued the design of the TI-1706SV and introduced in 2004 the BA II PLUS Professional and all-new TI-36X SOLAR. © Joerg Woerner, September 6, 2003. No reprints without written permission.